This week the Pond Hill-hating Wormsley Comprehensive makes its only appearance in the entire run of Pam of Pond Hill. It is such a neglected, rundown, graffiti-smeared dump it makes Pam appreciate Pond Hill. It’s no wonder the Wormsley pupils (“Worms”) are so rough. So could jealousy be the reason they hate Pond Hill? Pam and Steve never get the chance to even ask, for they get nabbed by the “Worms” and are now set to get a variant on tarring and feathering. Two Phil Townsend stories overlap this week: “The Ghost Dancer” (ends) and “Fancy Free!” (begins). Ferne embarks on secret training to get out of that wheelchair and back into her ballet shoes. Fancy Cole is a problem girl who wants to have the freedom to do anything she likes. That includes bullying, it would seem. Still, things could be so different if her mother was kinder and looked after the place more instead of indulging in bingo all the time. 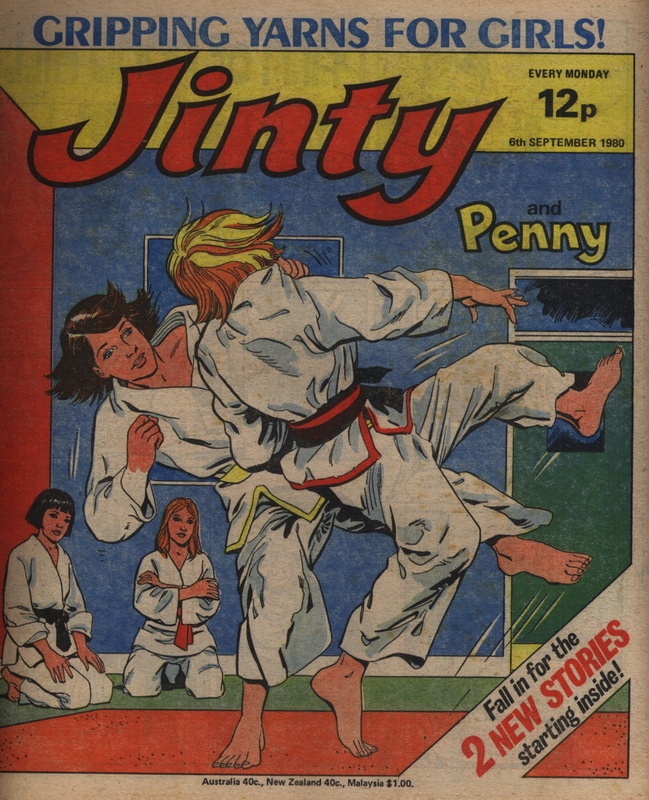 “A Spot of Trouble” is a Jinty and Penny special story. Apparently it is a filler, as two serials ended last issue but only one begins this issue. Natasha rescues an abandoned pup, Spot, in the Gulf States. The locals don’t much care for dogs, so the hotel manager doesn’t see the point in Natasha befriending Spot. He sees things in a new light when Spot saves Natasha from a deadly snake. The artist of this story is a bit uncertain. It looks like José Casanovas but it does not have the intricate detail that his other Jinty stories had. Perhaps it is an early Casanovas reprinted from somewhere. Tansy’s in a fix when she forgets Mother’s Day and has to lay her hands on a present fast. Sir Roger is embarrassed when he accompanies Gaye to the museum and finds a document he signed is on display, and it says he is “ignorant, timid and the biggest liar in the kingdom”. It’s hijinks time when he tries to keep Gaye from finding out. “The Long Shot” is the first of the text stories that will continue during 1981, with the spot illustrations being expanded for the covers. The cover could also be considered the last of the Mario Capaldi sports covers as it features a sport. There are no “Winning Ways” this week, so perhaps they have now been phased out. This week’s Gypsy Rose story is another recycled Strange Story (which appeared in June). Julie laughs at ghosts and the supernatural, and never refuses a dare. So she accepts a dare to spend the night in a house supposedly haunted by a vengeful Elizabeth I. Julie emerges not quite sure if what she saw that night was a dream or not, but she stops laughing at ghosts. The Storyteller was more smug about this than the paste-up of Gypsy Rose is. Julie also discovers a lost miniature that not only triggered the apparent haunting but also saves the house from demolition. The story has been uploaded to the Gypsy Rose gallery in the panel section. Miss Norm reveals the full story of how she became to be both the Hive Mother and the Gamma Girls’ secret trainer. Her training is paying off because the Gamma Girls are doing so well in the finals – much to the consternation of the bigoted Hive Inspector. Unfortunately Cassy made a bargain to let Perfecta beat her in the swimming marathon and sees no way out of it. However, the blurb for next week says fate is going to step in, so it sounds like there is a way out after all. Many thanks to Derek Marsden for the copy of this issue, which he kindly sent on to me. Pam is on a roll – her ‘witch ball’ brings her luck or so she thinks, and indeed it seems to be the case. By returning it to its rightful owner, her school benefits from help to go on a school trip to France (which leads us on to a whole other set of stories). “Girl The World Forgot” starts this issue. Initially it looks like an adventure story with a castaway plot, but later on it turns spooky. It is beautifully drawn by Veronica Weir, and through a comment on this blog we found out that it was also written by her too – one of only a very few cases where we know the artist and writer were the same person. Kathy Clowne is bullied by Sandra Simkins, as so often in her time at school. This time Sandra paints Kathy’s face in greasepaint to make her up in clownface. Not realizing that this has happened, Kathy snaps when a teacher comments ‘What have you done to your face?’ and of course a punishment now looms – even though really it is all Sandra’s fault. “The Swim For Life” is referred to as a ‘special story’ – it’s a complete two-page story that is presumably reprinted from an earlier title, but unusually it doesn’t fit into the mold of a Strange Story which was normally changed into a Gypsy Rose one. This one is a straightforward adventure story with a brave dog saving the brother and sister who went out in a speedboat and got into difficulties. There are no supernatural elements though, unlike in the Gypsy Rose story “The Unscheduled Stop” – which is likewise by John Armstrong. In this latter story, Jenny Shaw’s parents are arguing non-stop, until an unscheduled train stop shows her the reason in their earlier history for their bitterness, and a way to fix their future. The letters page this week includes a letter from Sophie Jackson, a science fiction fan, who loved “Land of No Tears” and asked for more SF like that story and “The Human Zoo”. She also specifically said how much she liked the artist who drew both stories and also others such as “Black Sheep of the Bartons” and “Pandora’s Box”, and wanted more by that artist. Perhaps this was part of the reason why the Jinty editors commissioned “Worlds Apart”, also drawn by Guy Peeters? Finally, it’s also the first episode of spooky-mysterious tennis story, “Child of the Rain”. Drawn by Phil Townsend, this story is flavoured with elements of the South American rainforest, which lends it particular interest in my eyes as I was living in South America at precisely this time. Despite this attraction, I have to admit it’s not the strongest story ever. Jemma West is a keen tennis player and hates the rain because it stops her playing – that is, until an accident in the rain forest, after which she starts to love the rain and to find it gives her extra strength and energy. It shares some similarities with “Spirit of the Lake” (mystery / supernatural elements, and sporting details) which we think is likely to have been written by Benita Brown – I wonder therefore if this story also might have been penned by the same writer.